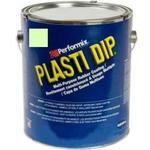 Phosphorescent Glow-In-The Dark Plasti Dip Flexible Rubber Coating. Plasti Dip Phosphorescent charges with light during the day and emits the light in the dark. For best results charge with strong light or sunlight. Absorbs light and emits that light in the dark. - Do your car Badges, wheels, or other items. or Just for Fun!! Use for safety reasons - where the lights may have gone out to show the way. Directional Arrows, Stair treads. Light Globes which will still glow in the case of a blackout, etc.